APOLLO ASTRONAUTS. Printed Document Signed, c. 1972. NASA Grumman Apollo Lunar Module Internal Components Brochure (Bethpage, NY: Grumman, 1969), eight acetate sheets with color overlaying drawings of multiple lunar module structures and components. 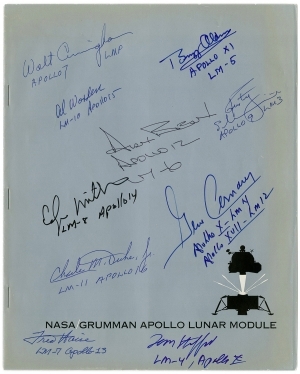 Signed by Apollo astronauts Buzz Aldrin, Alan Bean, Gene Cernan, Walt Cunningham, Charles M. Duke Jr., Fred Haise, Edgar Mitchell, Rusty Schwieckart, Tom Stafford, and Al Worden. 8 pp., 8 x 10 in. This promotional brochure released by Grumman during the Apollo Program lists 118 separate components. Color drawings of the Lunar Module are on the front and back of each acetate sheet. Components are identified by a fold-out legend on the back cover. Apollo was the third human spaceflight program by the National Aeronautics and Space Administration (NASA). Established in 1961, its first flight was Apollo 7 in 1966, and its first flight with a crew took place in October 1968. The last flight was Apollo 17 in December 1972. In six missions between July 1969 and December 1972 (Apollo 11-17), twelve men walked on the moon. Edwin Eugene “Buzz” Aldrin (b. 1930) was the Lunar Module Pilot for the Apollo 11. On July 21, 1969, Aldrin followed Neal Armstrong nine minutes after he became the first human to set foot on the moon. Alan Bean (1932-2018) was the Lunar Module Pilot for the Apollo 12 mission in 1969. He was the fourth person to walk on the moon. Eugene Cernan (1934-2017) was the Lunar Module Pilot for the Apollo 10 mission in 1969 and Commander of the Apollo 17 mission in 1972. On the latter mission, he became the eleventh person to walk on the moon. He reentered the lunar module after Harrison Schmitt, so Cernan is the last person to have walked on the moon. Charles M. Duke Jr. (b. 1935) was the Lunar Module Pilot for the Apollo 16 mission in 1972. He was the tenth and youngest person to walk on the moon. R. Walter Cunningham (b. 1932) was the Lunar Module Pilot for the Apollo 7 mission in 1968, the first Apollo program to carry a crew into space. Fred Haise (b. 1933) was the Lunar Module Pilot for the Apollo 13 mission in 1970. He would have been the sixth person to walk on the moon, but problems forced the mission to abort before the lunar landing. Edgar Mitchell (1930-2016) was the Lunar Module Pilot for the Apollo 14 mission in 1971. He was the sixth person to walk on the moon. Russell Louis “Rusty” Schwieckart (b. 1935) was the Lunar Module Pilot for the Apollo 9 mission in 1969. Thomas P. Stafford (b. 1930) was the Commander for the Apollo 10 mission in 1969, the second manned mission to orbit the moon and the first to fly a Lunar Module in lunar orbit. Alfred Merrill “Al” Worden (b. 1932) was the Command Module Pilot for the Apollo 15 mission in 1971.